The Lagos State Government has stated that the Apapa port was originally designed to receive imported goods and petroleum products and move them out by railway and pipelines, and not to receive articulated trucks and heavy duty vehicles that transport these products and goods to different parts of the country, THISDAY reports. Speaking at the 2017 Annual General Meeting (AGM) of the Lagos Zonal Office of the DPR, the Lagos State Commissioner for Energy and Mineral Resources, Mr. Wale Oluwo stated that all the stakeholders should go back to the original concept used in the design of the Apapa Port as a permanent solution to the current gridlock. He said when the port was conceived and started operations, it was not designed to welcome articulated trucks and heavy duty vehicles to come and take products and goods out from the port. The plan was for the port to receive goods and those goods are transported by railway through the Iddo terminal to the other parts of Nigeria. With petroleum products, he said the port was constructed to receive petroleum products from the international market and pipe those products through Mossimi Depot in Ogun State to other parts of Nigeria. He said government must resuscitate the railway lines and bring back the pipelines. 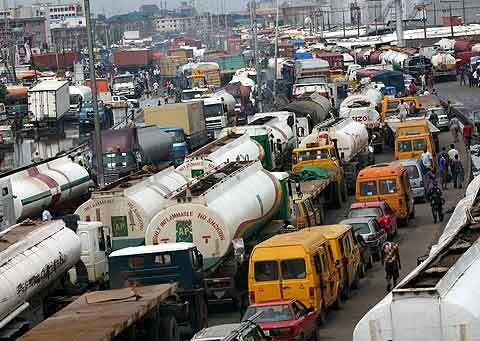 He also said the state government had set up a committee that would start work next week to work out strategies to solve the Apapa gridlock.